Needing a practical and also economical car, but not wanting to buy something really boring, we bought a 2008 Ford Focus, a 2nd generation hatchback. A boring car in every aspect, if not for the fact that it was bright blue. At least it’s blue, I thought. It was a good car and a crappy car at the same time. The good: it never left me stranded. For about 120.000 kilometers (75.000 miles) it brought me everywhere I wanted to go. 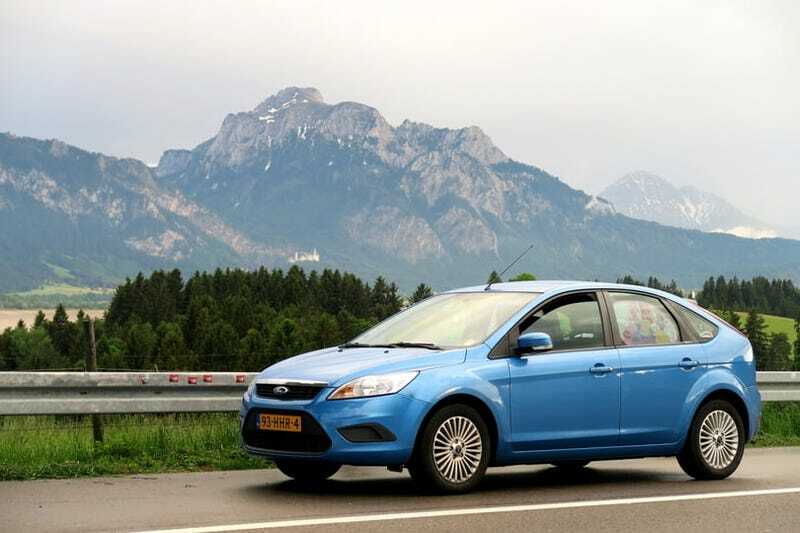 It was economical too, beating several much newer, equally sized cars in fuel consumption. It fitted most of the stuff I wanted to haul with it, whether it was debris from a house renovation or a selection of our worldly possessions going on holiday. And it was blue. However it was a boring car. With its 100 hp and 5-speed manual it was never fast. Going 110km/h (70mph) meant driving 3000rpm, which was never really relaxed. The car didn’t want to go this fast, and you constantly had to push it. Relax and you would find yourself driving below the posted speed limit. After four years, it was time for a new one. I picked... a bright blue Ford Focus. A 2016 3rd generation. Wanting to stay away from the 3-cylinder engines I went for the sportier 4 cylinder 150hp 1.5 liter. It has almost all the options that were in the book in 2016. And it is blue. It is a better car in every aspect. It is faster, it is a better cruiser, it has much better seats, it has a lot more gimmicks, it is more luxurious. And still, when it was time to pick up the new car and leave the old car behind, I felt bad. As it turned out I still had a strong connection with my crappy old car. I drove to the dealership with my head full of memories which involved this crappy car. The holidays abroad. The times I overloaded it with stuff. The times I considered myself lucky when hearing about friend’s rides breaking down. The times I loved it because it was blue. But more importantly: this was my daughter’s car. For her I bought it in the first place. This is the car I drove her home in for the first time. This is the holiday car. This is the car that is “daddy’s car”. Until now. I remember my dad’s car. I was interested in cars at an early age and I know my father’s bright green Ford Taunus sedan that he drove through the 80s. Its simple shape defined my taste in cars. This is the car I remember well. However, I also remember a golden brown car. This was my dad’s car before the Taunus. I now know he owned an Opel Ascona in that color, but I distinctly remember a golden brown car as a little kid. I couldn’t have been much older than four when my dad sold that car, but I still remembered it. The first car I knew. My dad’s car. ‘My daughter is the same age now as I was when my dad sold the golden brown car’, is the thought that went through my head driving to the dealership. ‘I’m leaving behind the car that will be the first car she remembers.’ Okay, it’s not helping the new car is almost exactly the same color, but still. Luckily, there’s good news. The new car will be the car that brings home my daughter’s little sister. New memories are awaiting.